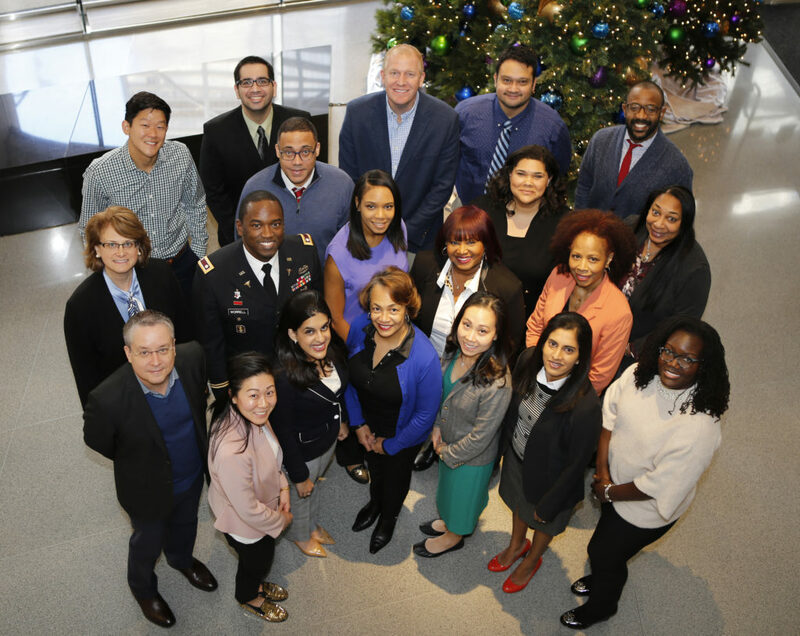 Leaders: The 2018-19 class of the Institute for Diversity in Leadership pose for a photo Dec. 7 at ADA Headquarters. From left to right (first row), Drs. Marcio da Fonseca, Josephine Chang Pallotto, Sarah Khan, Winifred J. Booker, Quyen Vu Ying, Aruna S. Rao, Zaneta T. Hamlin; (second row) Sarah H. Tomlinson, Dentonio Worrell, Chinara A. Garraway, Sheila L. Armstrong, Monica C. Anderson; (third row) Herminio Perez, Julie A. Gray, Raven R. Henderson; (fourth row) Wooram Alex Lee, Akshay Thusu, Michael C. Farmer, Alberto Enrique Varela, Carlos S. Smith. The American Dental Association Institute for Diversity in Leadership is accepting applications through April 12 for its 2019-20 class. Selected applicants will attend three leadership education sessions conducted by faculty from Northwestern University Kellogg School of Management and Duke University’s Fuqua School of Business at ADA Headquarters in Chicago. Participants will be reimbursed for their hotel and travel expenses. During their program year, the Institute class members will develop their leadership abilities through faculty seminars and experience designing and leading projects for their dental associations or other community organizations. Previous graduates of the program, which began in 2003, have created nonprofit organizations in their communities to provide dental health care and education to underserved populations, took on leadership roles on Mission of Mercy events, created programs introducing high school students to health care professions and raised awareness on a preventive approach to the opioid epidemic. Since 2003, over 200 dentists have been enrolled in the program. Institute alumni have since served as volunteer leaders at the local, state and national levels of the ADA, and other dental associations and service organizations. The ADA Institute for Diversity in Leadership is made possible through the support of Crest + Oral-B and Henry Schein, Inc.